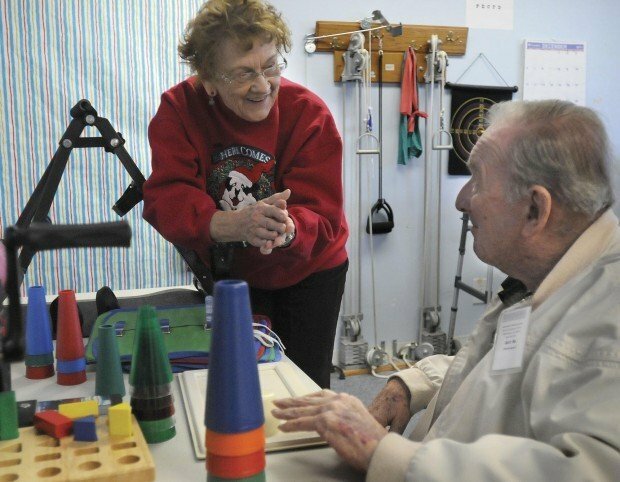 Physical therapist Phyllis Borgardt claps for Wisdom Center participant Art M. during an exercise. State government and a lawsuit is changing the way the Wisdom Center and Adult Day Health Care payments will be delivered. bingo with fellow participant Karen N.
When Wisdom Center Director Betsy Whitaker arrived at work on Dec. 1, she received a pleasant surprise. Despite months of bad news from Sacramento about Gov. Jerry Brown’s intentions to eliminate the Adult Day Health Care system, many of the center’s participants were ready and waiting for another day of activities. “We were slated to be closed Dec. 1, but people showed up anyway because they needed a respite,” Whitaker said. The Santa Maria center is one of about 300 Adult Day Health Care centers in the state that provide nursing and social services, physical and occupational therapy, counseling and hot meals to approximately 35,000 low-income and medically needy residents. 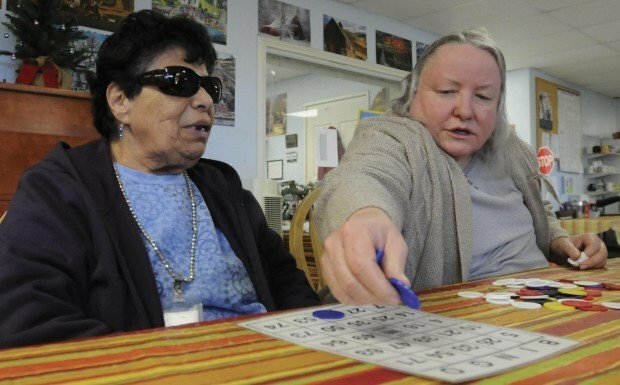 Many of the centers have closed, but those remaining open were given a reprieve when a settlement was reached in a federal lawsuit that challenged the state’s authority to eliminate the service as a Medi-Cal benefit. The compromise reached in the settlement preserves services offered under the ADHC system in a new program called Community Based Adult Services (CBAS). The Adult Day Health Care program still will be eliminated on Feb. 29, but the services will continue to be offered through the new system. There will be a transition period between the two systems from Dec. 19 to Jan. 31, Whitaker said. Participants with certain conditions or needs — such as brain injuries, chronic mental illness, moderate to severe Alzheimer’s Disease or dementia or developmental disabilities — automatically qualify for the CBAS program. Others will go through an assessment process, Whitaker said. The state Department of Health will assess both patients and the Wisdom Center for inclusion in the CBAS system. The Wisdom Center cares for approximately 60 low-income and medically fragile participants from the Five Cities area in San Luis Obispo County to Lompoc. It offers both day health care and day care programs. Veterans also can utilize the center with their VA benefits. Even with the promise of a new health care system, Whitaker said the Wisdom Center’s survival isn’t guaranteed. For more information about the Wisdom Center, call 349-9810.